Bought for my 3 year olds room, loved it. It’s super cute and good quality! Brighten up your kid's bedroom with the Urban Habitat Kids Ensley Cotton Jacquard Pompom Coverlet Set. The 100-percent cotton coverlet and sham(s) features multi-colored jacquard pompoms that pop against the soft white base fabric, for a fun textured look. Two decorative pillows (12x16, 16x16) provide the perfect finishing touches to the bedding set. Soft, comfortable, and full of charm, this coverlet set comes prewashed for softness and is machine washable to make cleaning easy. Dimensions 88.0 In. X 68.0 In. X 1.0 In. 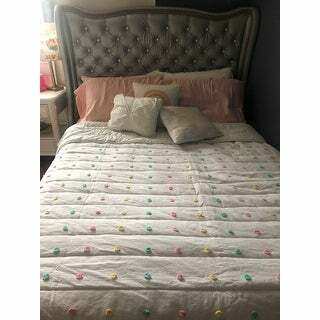 We bought this coverlet set for our 4 year old granddaughter for Christmas since she just received new bedroom furniture. 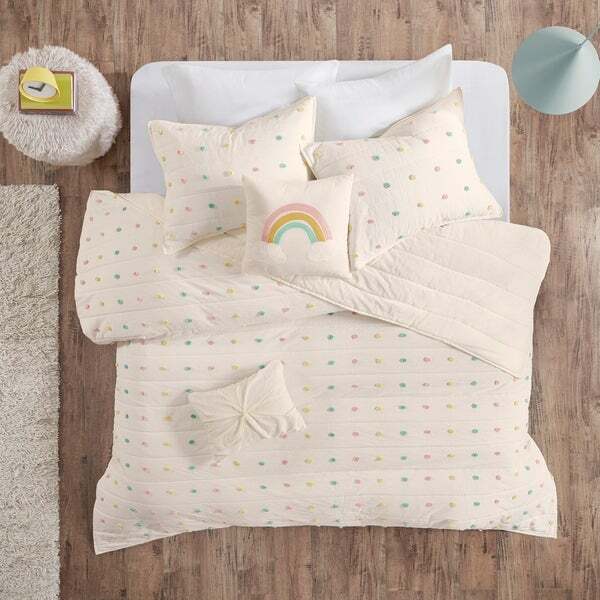 It is so pretty and she loves the little rainbow pillow that comes with it! It is nicely made and softly feminine. Really adorable quilt. Pillows also very cute. A couple dirt marks on the pillows likely from whatever warehouse these were stored in. Love the off white color and adorable thread pom poms. Beautiful bed set! My girls absolutely love it. And I’m glad they had the coverlet option instead of just having the comforter, it’s perfect for the warmer weather. Colors look beautiful and it feels well made. The cushions feel a little cheaper and the covers seem loose around the inserts they came with. Totally fine for my kids room though.